What is Alexa Ranking? How Important is it? In order to compare websites and evaluate their popularity there are several tools on the Internet which generate comparison information. One of the most well-known is Alexa Rank. Alexa is a subsidiary of Amazon, and delivers a ranking indicator about the traffic of a website. The smaller the ranking, the more popular the website, and the greater number of visitors (so is the common belief). This sort of information is of vital importance for both webmasters (to judge the efficacy of their own site), and for promoters (to judge which sites to spend money on advertising their own products). However, an “indicator“, by definition, is nothing more than a ‘pointing or directing device’ without any quantitative declaration. In other words, it has little concrete meaning or application. Alexa itself says that sites ranked 100,000+ may be subject to large ranking swings due to the scarcity of data for those sites, and yet advertising agencies place enormous importance on the Alexa ranking of websites they are trying to judge. You will even find that most Internet Service Providers offering website reviews factor in Alexa Rank as a relevant criterion. Alexa ranking is actually only relevant for the top 100,000 (0.33%) of the 30 million websites worldwide it monitors, and Alexa itself states that ranking for sites with relatively low traffic are subject to greater volatility. This of course also applies to Alexa’s estimates of visitor numbers, site usage, demographics and country popularity. Nevertheless, Alexa ranking is highly valued throughout the Internet and it seems that a massive number of marketers rely solely on the information displayed by Alexa, making sales decisions based upon what is essentially just educated guesswork. Why is Alexa is not Accurate? Alexa’s traffic estimates are based on Alexa toolbar users. If you take the time to read Alexa’s help pages then you will find it is clearly stated that “there may not be sufficient data from a particular country, because there are not enough toolbar users who visit the site”. Translated into layman’s language, Alexa can only capture data about a website if its visitors have the Alexa toolbar installed in the browser they are using to view that site. Furthermore, it must also be noted that the toolbar currently only tracks visits by just three selected browsers: Internet-Explorer, Google Chrome, and Firefox. Users of other browsers or mobile devices are not counted; Alexa simply has no way of counting them. To reiterate, what you can see using Alexa ranking data and visitor estimates is the data generated from visitors who have an Alexa toolbar, and nothing else! And this is the case especially for webmasters and website developers who install the toolbar in their browsers. The screenshot on the right shows the real browser distribution of Soccerwidow/ Fussballwitwe visitors over the last three months. 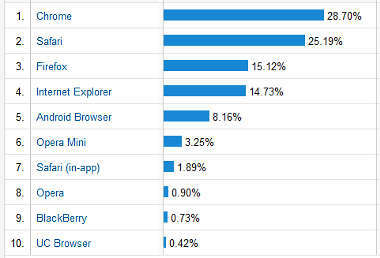 25.19% of all visitors used the Safari browser, which is especially popular in the United States. Therefore, a quarter of our entire visitors are simply not detected by Alexa as there is no toolbar for Safari. For a site the size of Soccerwidow/ Fussballwitwe, this is not an inconsequential factor and some 30,000 unique visits were therefore not captured by Alexa during the last three months. Internet Explorer, Google Chrome, and Firefox users, and only if they have the Alexa toolbar installed, are the sole visitors counted towards Alexa rank and traffic estimations. Chrome is especially popular in India and the Philippines, whilst both Firefox and Internet Explorer are widely used in Germany. As Soccerwidow.com is addressing an international audience, these issues inevitably lead to completely misleading Alexa estimates of visitor behaviour, and despite this irrationality (probably being the case for most websites on the Net), it is still extremely important for any site to have a good Alexa rank.